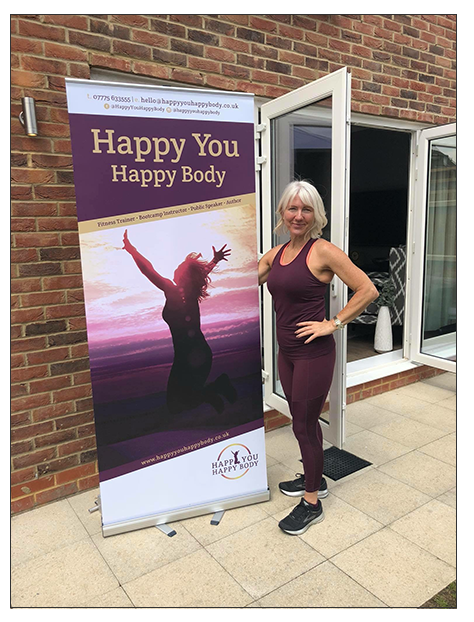 Based in Kent, Karen Jones is a Personal Fitness Instructor who provides personal training sessions, runs fitness bootcamps and teaches yoga in Orpington. Karen is also a published Author and an engaging Public Speaker with a story to tell. I met with Karen Jones back in January 2017 as we were referred to each other by a mutual contact. At the time, Karen needed a book cover designed for her debut book which was due for release in September 2017. This book was due to be launched under her current business, Mad Mother’s Bootcamp. We got to know each other initially over a number of discovery workshops; where we brainstormed ideas for the book cover design. We built our creative relationship over a period of time. I got to know, in great detail, Karen’s big mission and her overall vision for her business and it soon became apparent that the Mad Mother’s Bootcamp brand didn’t really sit very well with where Karen wanted to take her business. Karen wanted to attract mums who had recently given birth, her mission was to help them feel good about themselves again after their pregnancy. It’s not just about losing weight, Karen’s mission is to help mums love their body again, a subject very close to Karen’s heart. Karen takes an holistic approach and focuses on the overall wellbeing of her Clients, it’s not just about helping them to shed excess weight but to transform their mindset so that they feel great about the body they are in. The problem was that Karen was struggling to fill her classes, she wasn’t attracting the right audience therefore making very little turnover. Through open & honest discussions, Karen soon realised that the identity she currently had and the message she was communicating wasn’t aligned with her overall vision. The perception she had created was very disjointed, there was no core brand message. Karen has a huge wealth of experience, expertise & passion for what she does but this wasn’t being communicated effectively. Her existing website wasn’t very clear with confusing content that had no real direction. It was important to realign Karen’s brand to her vision, and so it was decided that a complete rebrand – rather than just a name change – would be the most appropriate avenue to take. A book cover was still needed but before we could start work on it, we needed to go right back to the beginning; the process of formulating a new brand identity had started! The first step in this process was for Karen was to write down every single possible name she could think of in a spider diagram. It didn’t matter whether they were right or not, this exercise was simply to help get everything down on paper. Karen came up some with weird and wonderful names, however it was eventually decided that Happy You, Happy Body was the name that Karen resonated with the most; and having got to know Karen well throughout our sessions together, it was a name that I also felt was a strong fit with her ethos and drive. 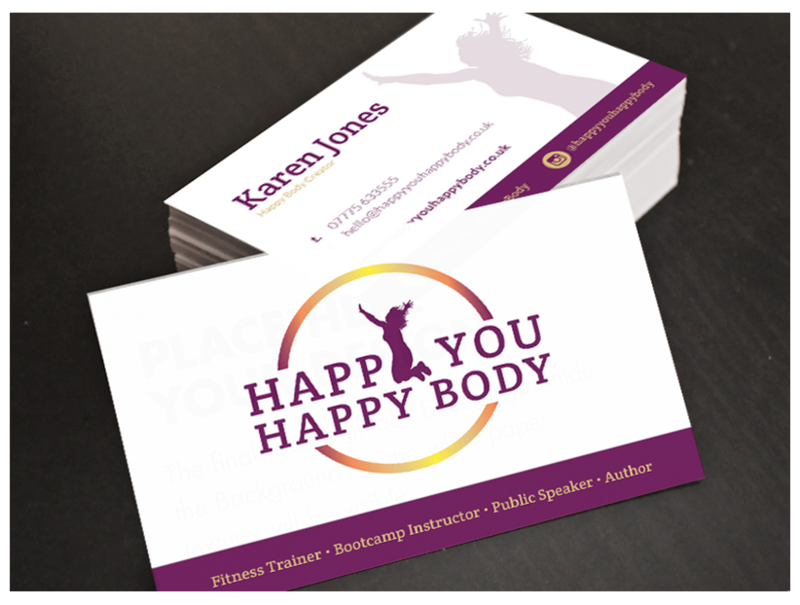 Karen is a very positive, happy, dynamic and forward-thinking businesswoman so it was vital that these qualities were reflected throughout her new brand identity. Of course challenges were experienced along the way. Having carried out a full branding audit, I discovered that the existing web presence of the Mad Mother’s Bootcamp was non-existent and so was of no value to Karen; which meant that there was no existing web audience to launch to. Once the name had been decided, research needed to be carried out to understand the market in which the ‘Happy You Happy Body’ brand would be operating in. In order for Karen’s business to be successful, Karen needed to understand her USP (Unique Selling Point) and also where she wanted her business to be positioned in the market place. This market is saturated with Personal Trainers and fitness specialists so it was important for Karen to understand that she needed to position her business differently from all the others. Adopting a bespoke approach to Karen’s requirements, Karen and I worked together across a series of workshops to ascertain what parts of her current brand which were successful and which parts weren’t. It was important that her brand message was refined and clarified so that customers could be certain what she could offer them, why she does what she does and then benefits of working with her. Although I designed a variety of different logos, the one that really stood out to Karen is the one where she is in her logo. As Karen is her brand, she loved the idea of being part of her physical identity. Once the logo had been approved, we moved on to designing the book cover, marketing material (such a business stationery, pull-up banner, leaflets, social media visuals, book launch invitation, email footer etc) and website where I liased closely with Karen at all times to ensure design consistency across her entire brand. Working with Karen on her website proved to be smooth and seamless – with quick client approval achieved at each stage. Karen also chose to use Pink Lemon’s hosting solutions post web build. 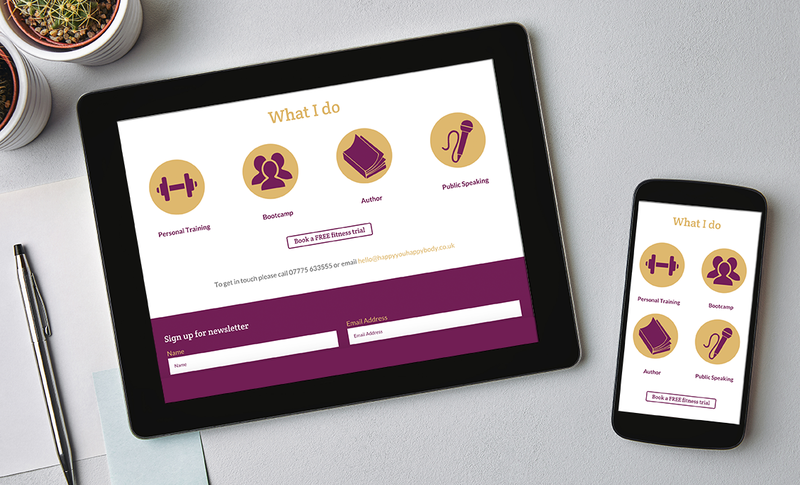 Phase 1 of the website was built to include all requirements requested by Karen with a view that there would be a further development stage at Phase 2 whereby a fitness membership area would be integrated into the website as Karen wants to provide affordable and effective home-based fitness workouts. 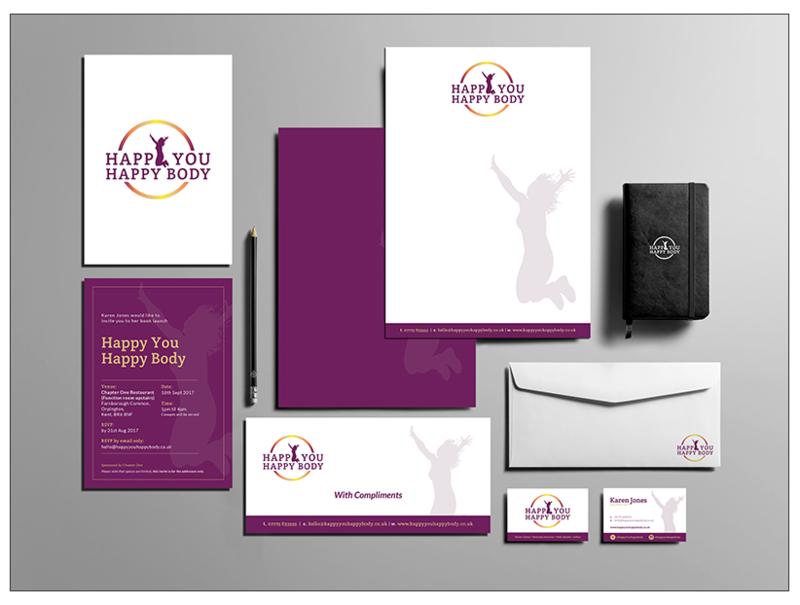 Happy You Happy Body’s new brand image now has a more sophisticated and energetic look and feel with bold use of colour and simple, modern fonts. The company’s new image is instantly more engaging and is more inline with the overall vision of the business. The new website now has a better user experience than the previous Mad Mothers Bootcamp which attracted very little traffic. It has a more clearly defined site structure so that Karen’s content can be accessed via a more straight forward journey through the website. 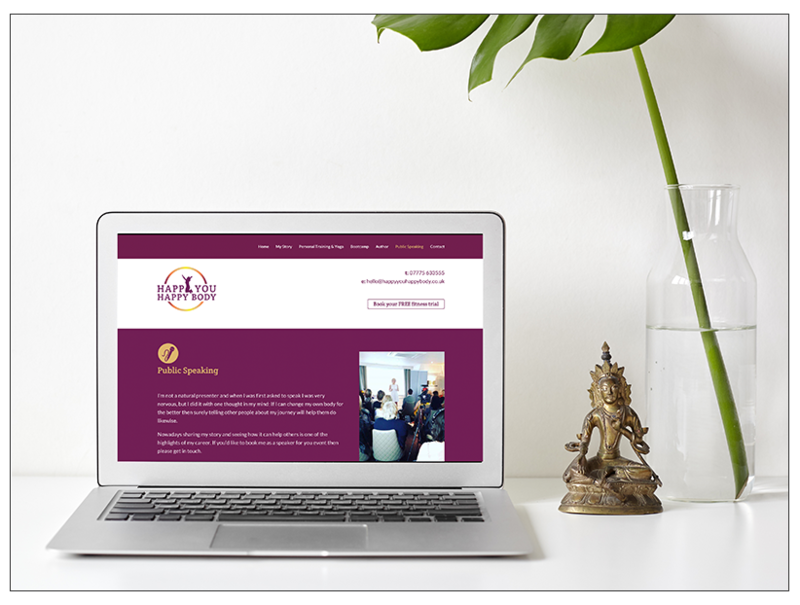 The new website is not only fully responsive, Karen now has a fully integrated CMS (Content Management System) whereby she can now add new content to her website as and when required. From the moment I met Karen, it was clear from her passion and love for what she does, had the potential for success.The problem she was facing was that her existing brand identity didn’t reflect where she wanted to take her business. She had purchased an off-the-shelf identity that had very little substance and therefore didn’t resonate with her audience. By going through a series of discovery workshops and taking time to get under the hood of her business, we were able to formulate a way forward. This process has enabled Karen to understand her business more, who her target audience are, what her USP is and how she wants her business to be seen. Not only does Karen now have confidence in what she offers but she is now gaining recognition through Awards for her efforts & services which is resulting in an increase of turnover. Rebranding your business is a journey that takes time, effort & investment. It’s not something that is achieved overnight however when a rebrand is done right, it can make a huge difference to the success and ultimately the bottomline of your business 💰. If you would like help rebranding your business then please do get in touch here. “Thank you Karen for creating my new branding identity. It was an absolute pleasure to work closely with you to get my brand on point to exactly how I wanted it to be. You are your brand and for anyone that may not know, that is actually me in my logo – the ‘Y’ in ‘HappY’. Not only has Karen designed my brand identity, she has also designed my book cover which I absolutely love! Karen has also designed my business cards, launch party invitations, exhibition banner and created my graphics for all my social media accounts!